In the series Chance Kristiina Lahde connects elements of chance to a process of replication and reversal. 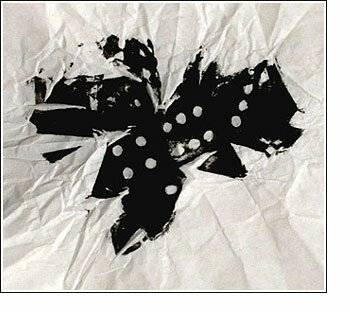 She uses dice as a stamp, applying ink to all sides then tossing the dice across the surface of paper or a floor. As the dice skips across the surface it leaves inky traces of where it has traveled with a complete print of the dice in it’s final resting spot. As the marks accumulate the artwork becomes a record of a series of actions. The chance throw is then re-created as a mirror image in ink or pencil.